The world conference on Cooperatives for Development and General Assembly of the ICA will be held in Kigali, Rwanda, from 14 to 17 October 2019. COOPS 4 DECENT WORK: 2019 International Day of Cooperatives theme! 6 July 2019 join us as we celebrate a future in which human development and social justice are priorities! 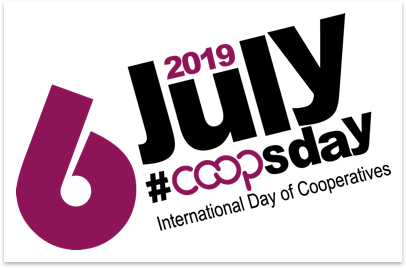 Stay tuned for the 2019 Coopsday interactive map and the Cooperators’ guide to the day itself, which will soon be available. The International Cooperative Alliance is currently implementing a partnership with the European Commission, ushering in a new phase of collaboration on strengthening the cooperative movement as development actor. Launched in 2001, a coop domain says that you are a cooperative that is part of a global movement of more than 3 million cooperatives worldwide with 1 billion members. Welcome to the International Cooperative Alliance! It was established in 1895 to promote the cooperative model. Today cooperative members represent at least 12% of humanity. As businesses driven by values and not by the remuneration of capital, the 3 million cooperatives on earth act together to build a better world. Cooperatives are people-centred enterprises jointly owned and democratically controlled by and for their members to realise their common socio-economic needs and aspirations. As enterprises based on values and principles, they put fairness and equality first allowing people to create sustainable enterprises that generate long-term jobs and prosperity. Managed by producers, users or workers, cooperatives are run according to the 'one member, one vote' rule. 10 of the world's employed population. The International Cooperative Alliance advocates the interests and success of cooperatives. We boost inter-cooperation, bringing together cooperative members, providing support instruments and disseminating know-how. We are the custodians of the cooperative identity and we endeavour to create an environment that allow cooperatives to be established and grow. We provide individuals and communities with an instrument of self-help and influence over their development. Sponsors’ logo will appear all along the actions. Surf the map to have a snapshot of our regional organisations. Click on the icons to access our sectoral organisations. Cooperatives Europe represents 141 million cooperators, uniting, promoting and developing cooperative enterprises across all business sectors in the European region. The International Co-operative Alliance Asia-Pacific is the regional organisation uniting, promoting and developing cooperative enterprises across all business sectors in Asia and the Pacific. Cooperatives of the Americas (formerly ICA-Americas) represents, supports and links around one hundred entities, including confederations, federations and primary cooperatives in the north, central, south and Caribbean region of the Americas. International Co-operative Alliance – Africa (The Alliance Africa) serves, unites and represents ICA member organizations in Africa and promotes and strengthens autonomous and viable co-operatives through-out the region. The International Co-operative Agricultural Organisation (ICAO) is the global representative of agricultural cooperatives. Founded in 1951, it's one of the International Co-operative Alliance's eight sectoral organizations. Consumer Co-operatives Worldwide (CCW) unites, represents, and defends the interests of organizations of consumer cooperatives around the globe. The International Fish Cooperative Organisation (ICFO) is a sectoral organisation established to promote the development of fisheries cooperatives around the world, to promote trade, to share co-operative training and education materials as well as information on fishery matters. The International Health Cooperative Organisation is a Sectoral Organisation of the ICA, created to promote the development of health cooperatives and provide information about their nature and role to international agencies and bodies. Co-operative Housing International is one of the eight sectoral organisations of the International Co-operative Alliance. It was established to promote the development of co-operative housing in all countries, and in particular developing countries, as an economic and social contribution to the problem of providing shelter. International Cooperative and Mutual Insurance Federation (ICMIF) is the only global representative body of the cooperative and mutual insurance sector. CICOPA is the International Organisation of Industrial and Service Cooperatives, a sector organisation of the International Cooperative Alliance since 1947.
namely 700 million individuals through its 315 members from 110 countries.